Jacob is almost 5 years old and started coming to me yesterday for a short three day intensive of twice a day to begin with. Yesterday he did not make eye contact at all. 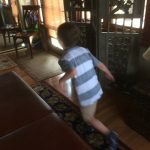 As a matter of fact when Mommy and Jacob arrived in the morning for their first lesson, he was screaming inconsolably as they walked up my walkway. I quietly greeted them both and welcomed into my studio and began to watch and gently interact with Jacob. I was thinking how can I make a difference with him in this short time. Mommy relaxed back her in chair as Jacob and I shared the same space of learning. He got a little more used to me after several minutes. Me observing him and him doing his thing wandering through my work space. Eventually, I created a lesson plan of connecting his brain and body sensations together. I could actually see he is quite bright, even with no affect on his face, I could see his potential for learning and sensing himself. Eventually, he became used to my touch and voice and began to gently guide my hands to where he would prefer to be touched. 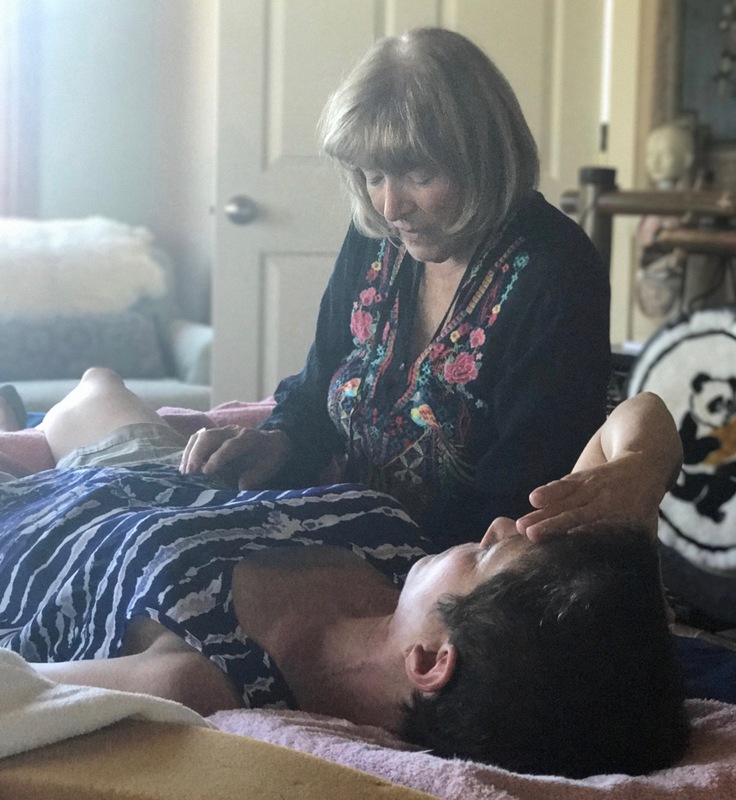 I worked with his belly, enteric nervous system, to connect with his central nervous system. In other words, connect the functioning of his organs and Vagal tone to his brain, therefore improving his sense of his self. Mom and I could see his getting the connections. It was working! When they arrived in the afternoon, he acted as if he were happy to come, walking straight into my studio and climbing right on to my Feldenkrais table. Ready, go! He took my hand and put it directly on his belly. When I quietly slipped it away, he put it back. This Jacob definitely knows what feels good and what he wants and needs. Smart boy! That morning was our third lesson and he came right in, again climbing on to my table. I managed to hide away his favorite noise making toy. Instead, setting down two rollers on the floor. Thank you Stacy Barrows for designing these smart rollers, they were just perfect. Today, Jacob was going to make leaps and bounds and he did just that. This boy walked so beautifully along the flat edge of the rollers, even stepping from one roller to the next. He also turned around so beautifully to walk back the other way. Let me go back to yesterday, when I asked him to set his shoes by the door, Jacob had no idea where the door actually was. But when I pointed to it two feet in front of him he could walk to the door and set them down. Today, when walking on the rollers, I said to watch for the second roller to step onto that one and you can see him clearly looking for the send roller and stepping to it. That was just one beautiful miracle. But, when I played back the video on my cell phone for him to watch, he actually watched it, he actually Did watch it. Not only did he watch it, he looked at the video, saw me in it with him, and then looked up directly into my eyes seeing me in front of him watching the video with him. Then looked back to the video. Today, not only did Jacob walk the walk, but he looked into my face and eyes and saw me, someone other than himself. His mom said it was one of the first times he’s ever looked at someone and really “seen” them. His eyes were so wide and beautiful, clear and fully cognizant of us around him. Jacob connected to the world today and mom couldn’t stop jumping for joy. Ok, me, too. Did I mention that when we went back to the table he let me smooch him on his face, joining me with HUGE smiles on his face in full recognition of connecting. Which is what our world is all about. Connecting.